Well located although traffic is miserable, loads of restaurants nearby, & a movie theater. Refrigerator didn't work, couldn't get luggage cart on checkout. We did not find this to be a great bargain. The hotel itself was a little under par, but we felt this was due to the large number of hurricane evacuees that were occupying the place. It is an older La Quinta, and not as nice as we expected. Good location, nice pool area, good breakfast. Noisy at night, bathroom fixtures in need of minor repair. The staff was nice. The rooms were not attractive at all. The smell on the elevator was awkward and so was the smell of the room. This does not meet the standards of a 2.5 star hotel. The pet-friendly La Quinta Inn Houston Greenway Plaza is southwest of downtown and comprises 129 affordable rooms equally suited to the business or pleasure traveler. Items included with the room rate at this three-story hotel are a shuttle to the nearby Texas Medical Center, a continental breakfast, high-speed Internet access, local telephone calls, a morning newspaper, in-room coffee and parking. There are two meeting rooms available for business or social functions. Area landmarks and attractions include the Houston Zoo, the citys museum district, Rice University, Minute Maid Park-Toyota Center, Lakewood Church, the George R. Brown Convention Center and Reliant Park. The rooms come with a choice of one king size bed or two double beds. The amenities include a work desk with high-speed Internet access, telephone with voicemail, coffeemaker, 27-inch television with cable movie and news channels, coffeemaker, radio-alarm clock, iron and ironing board and a hairdryer. Some rooms have the added benefits of a recliner, microwave oven and a refrigerator Suites and handicap accessible rooms are available. This hotel has an outdoor swimming pool. The 24-hour front desk has information on area attractions and events and can assist with copy and fax needs. Other amenities include a guest laundry, daily housekeeping and vending machines. The complimentary breakfast is the only meal served here. Restaurants nearby include a Whataburger, the Cleburne Cafeteria, the Ragin Cajun, a Fuddruckers, the Avalon Diner, Goodie's Seafood, the Thai Bistro and a Denny's. 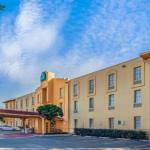 This La Quinta offers great value according to several visitors to Houston who have stayed here. They say the rooms are nicely up-dated, well-equipped and comfortable. The property is close to a busy highway but noise inside the property was not a problem. There are good restaurants within walking distance and the cheerful crew at the front desk had helpful advice about which were the best and they also had an extensive knowledge about the sights to see and where to shop.